1. Bannwarth, B., et al: Fibromyalgia syndrome in the general population of France: a prevalence study. Joint Bone Spine, 2009. 76(2): p. 184-7. 2. Lawrence, R.C., et al: Estimates of the prevalence of arthritis and other rheumatic conditions in the United States. Part II. Arthritis Rheum, 2008. 58(1): p. 26-35. 3. Wright, C. L., et al: Duloxetine for the treatment of fibromyalgia. Expert Rev Clin Immunol, 2010. 6(5): p. 745-56. 4. 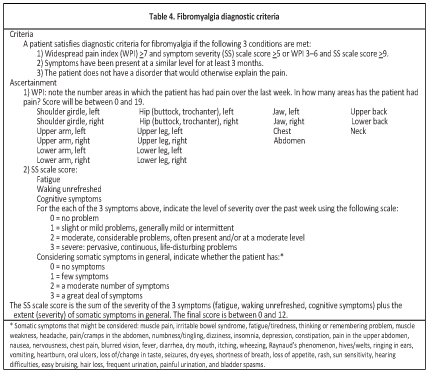 Annemans, L., K. Le Lay, and C. Taieb, Societal and patient burden of fibromyalgia syndrome. Pharmacoeconomics, 2009. 27(7): p. 547-59. 5. ACR Fibromyalgia Diagnostic Criteria. National Fibromyalgia Research Association Web site. 6. Sarzi-Puttini, P., F. Atzeni, and P.J. Mease, Chronic widespread pain: from peripheral to central evolution. Best Pract Res Clin Rheumatol, 2011. 25(2): p. 133-9. 7. Schmidt-Wilcke, T. and D.J. Clauw, Fibromyalgia: from pathophysiology to therapy. Nat Rev Rheumatol, 2011. 7(9): p. 518-27. 8. Wolfe, F., et al., The American College of Rheumatology preliminary diagnostic criteria for fibromyalgia and measurement of symptom severity. Arthritis Care Res (Hoboken), 2010. 62(5): p. 600-10. 9. 林承昌，陳睿俊， 柯朝元，淺談纖維肌痛症 基層醫學. 21(9): p. 232~235. 11. EULAR Issues Guidelines for the Treatment of Fibromyalgia Syndrome. Ann Rheum Dis., 2007. 12. Altan, L., et al: Investigation of the effects of pool-based exercise on fibromyalgia syndrome. Rheumatol Int, 2004. 24(5): p. 272-7. 13. Wang, C., et al: A randomized trial of tai chi for fibromyalgia. N Engl J Med, 2010. 363(8): p. 743-54. 14. Bennett, R. and D. Nelson, Cognitive behavioral therapy for fibromyalgia. Nat Clin Pract Rheumatol, 2006. 2(8): p. 416-24. 15. Rooks, D.S., et al: Group exercise, education, and combination self-management in women with fibromyalgia: a randomized trial. Arch Intern Med, 2007. 167(20): p. 2192-200. Fibromyalgia (FM or FMS) is a medical disorder characterized by chronic widespread pain and allodynia, a heightened and painful response to pressure. It is estimated to affect about 2% of the whole world population, with a female to male incidence ratio of approximately 9:1. FMS has been fraught with ambiguity in diagnosis, uncertainty in understanding of its pathophysiology, and difficulties for physicians in managing it competently. In 2010, the American College of Rheumatology (ACR) diagnostic criteria for FMS included widespread pain index (WPI) and symptom severity (SS) scale. The SS scale and the WPI were then combined to form a new case definition of FMS: WPI of 7 or higher and SS of 5 or higher or WPI of 3 to 6 and SS of 9 or higher. There are 3 FDA-approved medications for the treatment of fibromyalgia. Two of them, duloxetine and milnacipran, are considered SNRI agents, and the other one, pregabalin, is considered anticonvulsant agent. Furthermore, other medications can help reduce the pain of fibromyalgia and improve sleep including nonsteroidal anti-inflammatory drugs (NSAIDs), narcotic analgesics, antidepressants and anti-seizure drugs. As with many other medically unexplained syndromes, there is no universally accepted treatment or cure for fibromyalgia. Indeed, integrated treatment plans that incorporate medication, patient education, aerobic exercise and cognitive-behavioral therapy have been shown to be effective in alleviating pain and other fibromyalgia-related symptoms.